We’d love your help. 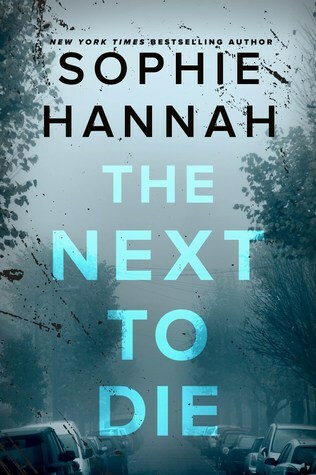 Let us know what’s wrong with this preview of The Next to Die by Sophie Hannah. A psychopath the police have dubbed “Billy Dead Mates” is targeting pairs of be The New York Times bestselling author of The Monogram Murders and Woman with a Secret returns with a disturbing tale of psychological suspense and obsession that hits at the heart of some of our most precious relationships. To ask other readers questions about The Next to Die, please sign up. Hey there! Anyone know when this will come out in US? And what the title will be? On the same point I have to say the “Whydunnit” in this is genuis and is quite simply my favourite whydunnit in the history of all whydunnits. I’m not sure Whydunnit is actually a word but if it is not it should be. With “The Narrow Bed” we also get Simon Waterhouse – one of my favourite literary detectives and a character I adore, although if I had to actually live with him for more than 5 minutes it would probably be me under arrest for murder. He is and has been throughout the Culver Valley crime series a most fascinating character. Again like no other, his quirks and foibles are beyond enthralling, he is in fine form in this instalment and once more I found myself endlessly sympathising with poor Charlie. Although she chose to marry him….. This time he is tracking a killer – one who targets best friends, killing them separately and leaving no clues. The police are stumped, the motive is as elusive as the killer and there seems no way forward. Then a witness appears who believes she may have been targeted..
And there you have the thing that changes “The Narrow Bed” from the usually sparkly storytelling you get in Ms Hannah’s writing to a full on firework display. Kim Tribbeck is an amazingly well drawn character and quite simply hilarious. A stroke of genius to make her an actual stand up comedian – I spent so much of this novel absolutely crying with laughter, pretty much from the very first page when she is talking fictional detectives..an ironically clever little part of the book which just sets you up perfectly for the rest. The story has its addictive twists and turns, some more ongoing family and other drama from our usual criminally good main characters -and with the added joy of Kim’s inner monologue and outer often insightful interaction with Simon and Co, The Narrow Bed has now taken over from Hurting Distance as my favourite Sophie Hannah novel. I just adore these. Really great writing, really great storytelling, totally addictive plots and a cast to die for. What’s not to love? Billy Dead Mates is a new serial killer in town. He targets pairs of best friends. Each is given a small white book sometimes weeks before they die. He kills one, then he kills their best friend. So far, the tally is up to four. The cops have no clues, no leads, no motive. Comedienne Kim Tribbeck is watching the television when news come on, with a special report on Billy Dead Mates. Kim sits up and remembers that she, too, received a white book one day a few weeks ago. She was performing in a comedy club and she later found the book. There was one line of printing. However, she threw the book away. Was it the serial killer? Is she being stalked for a future victim? She really doesn't have any close friends and she has trust issues, so why would she be targeted? If it’s not her, then who will be the next to die? It starts with a bang and then seems to fizzle. The beginning is promising, but when it takes multiple pages of conversation among 6 cops debating why his name was chosen and what can it mean. A little page turning on my part and the suspense picked up. There were other moments where the story seemed to lag a bit, but its well worth hanging in there for the other parts. The character of Kim is a bit unique. She does have a sense of humor ... she makes this book infinitely more enjoyable. She is finely drawn and credible. It's an interesting look at friendships and relationships amid the seemingly senseless murders. The cops themselves were a little bland,,,, not what I was expecting. Many thanks to the author / William Morrow / Edelweiss for the advanced digital copy of this psychological suspense. Opinions expressed here are unbiased and entirely my own. Interesting with an original storyline, but a little too drawn out. Chapter one held so much promise. I was sucked right in and thought this was going to be one of those books I just couldn’t put down. Then we heard from the detectives and the story started to drag on. The book starts off in a hospital ward, where the grandma of stand-up comedian Kim Tribbeck is dying of Cancer. A psychopath is killing pairs of best friends—BFFL—Best Friends For Life. Before they die, each victim is given a small Interesting with an original storyline, but a little too drawn out. Chapter one held so much promise. I was sucked right in and thought this was going to be one of those books I just couldn’t put down. Then we heard from the detectives and the story started to drag on. A psychopath is killing pairs of best friends—BFFL—Best Friends For Life. Before they die, each victim is given a small white book. When hearing of this on the news, Kim recalls being given a small white book at one of her gigs the previous year. Kim has no BFFL—no friends at all for that matter—and wasn’t killed after receiving the book. The investigators aren’t sure why the killer—Billy Dead Mates—would target her. Unable to figure out what the white books symbolize and why the killer leaves them behind, the investigators turn to Kim for help. Kim Tribbeck was quirky, funny and the chapters told from her POV were quite entertaining! But I found most chapters told by the detective’s POV somewhat dull. I’d have to say Kim was the reason I didn’t give up on the story. And Sondra Halliday was a little over-the-top, with her radical feminism! I found myself begging Billy Dead Mates to choose her as his next victim! The entire portion dedicated to Charlie investigating her sister’s secretive behavior was pointless—or I missed something. And the ending—the reason for the killings—was pretty bland. A lot of the useless info could have been left out and it would have been a much easier read. I've read a lot of Sophie Hannah's books and have found they get more and more outlandish but this one is just unbelievable,I'm incredulous that anyone can go along with this utterly ludicrous plot and totally neurotic set of characters with ridiculous idiosyncrasies. Stand-up comedian Kim Tribbeck finds the interaction strange when she receives a little white book at a gig while on tour. But it only becomes truly significant when she realizes, much later, that the little white book is key to a murder investigation. Someone--dubbed Billy Dead Mates by the police--is killing pairs of best friends. Each has received a little white book right before they died. But Kim is still alive. For now. And, as she easily admits, she has no friends. Certainly not a best fr Stand-up comedian Kim Tribbeck finds the interaction strange when she receives a little white book at a gig while on tour. But it only becomes truly significant when she realizes, much later, that the little white book is key to a murder investigation. Someone--dubbed Billy Dead Mates by the police--is killing pairs of best friends. Each has received a little white book right before they died. But Kim is still alive. For now. And, as she easily admits, she has no friends. Certainly not a best friend. Why is Billy targeting her? And is someone else going to wind up dead? OK, I won't lie, this was a really strange book. But, I also found it oddly captivating. I didn't realize until I started it--my mistake--that this was book #10 in a series. I am not a fan of picking up mid-series, though Goodreads tells me I read books #1 and #3 a while back. And I do somewhat remember Simon Waterhouse. Still, I felt like an outsider looking in somewhat, and I bet I would have enjoyed this one more if I knew more of the backstory of Simon, his wife, Charlie, and their investigative team. However, the mystery here stands alone, and while it's bizarre (I can guarantee the motive in this one will be one of the most strange and enjoyable you'll have seen in quite some time), it's compelling and even funny. The story unfolds from the point of view of Kim, who is telling things via a self-written true crime book that details her involvement in the Billy Dead Mates murder investigation. Then we get Simon and Charlie's view of the Billy investigation. And, finally, the writings of a rather crazed feminist reporter named Sondra Halliday who claims Billy is killing women due to misogynist reasons. It all culminates in a detailed yet surprisingly suspenseful story--Kim is center stage, but also a suspect in some ways. She's a bitter, funny comedian, and I really liked her character. Hannah captures interactions well, and I enjoyed both Kim and grumpy yet brilliant Simon. The whole book was very different for a thriller, but oddly enjoyable too. There were definitely times when I wished things would hurry along; there's a side plot where Charlie obsesses about her sister, which just seems annoying, and some of Sondra's rants are just a bit too much. Still, it's easy to get caught up in the story, especially Kim's book and Charlie and Simon's investigation. The format is different but engaging. Overall, while this one was a little strange and slow, I did enjoy it. Hannah is a great writer, and her characters are vivid, flawed, and humorous. The plot is definitely different, but it will draw you in. 3.5+ stars. I received a copy of this novel from the publisher and Edelweiss in return for an unbiased review (thank you!). This review has been hidden because it contains spoilers. To view it, click here. I'm pretty used to crime novels having implausible endings, and normally it doesn't bother me as I figure if I've enjoyed 95% of a book, I've got my money's worth. This one, however, might be the stupidest motivation for murder I've ever happened upon in fiction. Aside from that, the story was very over-written, the dialogue dragging on and on with so much unnecessary conversation, and the ongoing saga of Charlie's sister and her secret boyfriend is more excruciating than when Eastenders took a I'm pretty used to crime novels having implausible endings, and normally it doesn't bother me as I figure if I've enjoyed 95% of a book, I've got my money's worth. This one, however, might be the stupidest motivation for murder I've ever happened upon in fiction. Aside from that, the story was very over-written, the dialogue dragging on and on with so much unnecessary conversation, and the ongoing saga of Charlie's sister and her secret boyfriend is more excruciating than when Eastenders took a year and a half to reveal Lucy's killer. Does anyone care in the slightest about this plot? And why are the two main cops so annoyingly weird, but for no apparent reason? I started reading the Spilling novels after enjoying A Game For All The Family, but I think I've finally decided to give up and maybe just read the author's standalone novels. I’m a huge fan of Sophie Hannah. I just adore the Culver Valley series or as I call it ‘Simon and Charlie’. It is everything I want from a read; clever, articulate, hilarious and utterly addictive. The latest instalment The Narrow Bed is no exception. It’s not easy describing the story. We have a killer lurking and murdering pairs of best friends. He has been termed ‘Billy Dead Mates’ by the police. There is the absolutely hilarious comedian Kim Tribbeck, who we see has caught the attention of Bi I’m a huge fan of Sophie Hannah. I just adore the Culver Valley series or as I call it ‘Simon and Charlie’. It is everything I want from a read; clever, articulate, hilarious and utterly addictive. The latest instalment The Narrow Bed is no exception. It’s not easy describing the story. We have a killer lurking and murdering pairs of best friends. He has been termed ‘Billy Dead Mates’ by the police. There is the absolutely hilarious comedian Kim Tribbeck, who we see has caught the attention of Billy. Kim is dealing with the up coming death of her grandmother on a cancer ward, in a witty humorous and inappropriate way. Simon Waterhouse, our exceedingly clever detective constable is on the case. There is a lovely character Sondra Halliday, a devout feminist who pops up and makes her feelings clear on the ‘Billy Dead Mates’ case. She was chillingly real. And Charlie manages to get herself involved in the case, as well as doing a bit of sister stalking on the side. Who is Billy? That is the question. And will the police ever catch him? Sophie Hannah is a genius in quirky British crime. She is top of the class. Her characters are all a bit weird, perhaps reflecting the eccentricity of us all. Let’s face it, there is no such thing as normal. I think you either get it and love it. Or it goes a bit over your head. The plot for me was a dream. I could completely relate to the motives of our killer. I adored Kim Tribbeck and her lovely comic take on everything. The opening chapters had me laughing and cheering. I would buy Kim’s book ‘Origami’, if this all was real. And I am a little bit in awe of the super intelligence of Simon Waterhouse. He just susses things out, with total clarity, while everyone around him scratches their heads. Wonderful. If only I didn’t have a long wait now, til the next Simon and Charlie adventure! If you like intelligent crime, Sophie Hannah is a must read. I really didn't enjoy this book, in all honesty it was a chore to read and I'm just glad to have finished it. It started out well, but as it progressed I felt less inclined to find out where it was all going and really just wanted to see who was behind the murders. The characters just weren't interesting enough to hold my entertainment, and where the Police investigation was involved I felt I was scrambling to remember which of the numerous detectives was which (I gave up in the end trying to wo I really didn't enjoy this book, in all honesty it was a chore to read and I'm just glad to have finished it. It started out well, but as it progressed I felt less inclined to find out where it was all going and really just wanted to see who was behind the murders. The characters just weren't interesting enough to hold my entertainment, and where the Police investigation was involved I felt I was scrambling to remember which of the numerous detectives was which (I gave up in the end trying to work out who was who and just read over the dialogue etc without taking it in). Plot dragged too much for me, sub plot was neither here nor there for me, have a feeling this book could have easily done without the sub plot and it wouldn't make much difference to the overall story. Once the final reveal was made it seemed quite lacklustre for me. I can see why so many people like Hannah's writing, it twists and turns, and in some cases the psychological thriller she pens has many in awe, but sadly it's just not for me. This is the second of her books that I've read and can honestly say that her books just aren't for me at all. I couldn't wait to read The Narrow Bed, the 10th in the Spilling CID series - and (unlike a lot of other things that have taken place over the last week) I sure as hell wasn't disappointed! The characters of this series are halfway to what makes it so amazing; even the Detectives you know are absolute arses (Sellers, for one) are somehow likeable. The main man, of course, is Detective Simon Waterhouse. His character just gets better and better as the series goes on, and in The Narrow Bed we see the full force of his character and how he's so stuck in his ways - how does Charlie put up with him, a question which no doubt confuses many, with an answer that I'd guess is ultimately: he is brilliant. He's a brilliant detective and character, and I love following him as he solves another case. The narrative in this novel is really interesting as for a large portion of it we see into the mind of comedian Kim Trebbeck, quite a tricky woman and not someone I'd choose to be friends with in many ways - though she is very funny (no surprise there though, given her occupation!) and would no doubt be quite a good laugh to go out with. She's evidently written a book of sorts about the 'Billy Kill Mates' case that she becomes embroiled in, and we see snippets of this which offers an alternative perspective to the case. This isn't necessarily unusual for Sophie Hannah's books, particularly in this series - we often find out more about some of the victims and associated characters than we would in other crime series, and I love that. This was definitely a slight shift in its storytelling, though... and I loved it! The story is as complex and twisty as ever, and I managed to get a bit lost towards the end but couldn't care less that my tired brain couldn't work it out - when can I ever? - because getting to the conclusion is so much fun. I could read these novels all day; long live this series... I hope there's many more to come! I love books that feature unusual protagonists, so this one fitted right into that category. Kim Tribbeck is a stand-up comedian who, like most comedians, has a dark side, and some unusual quirks. I loved seeing the world through her POV, and she really drove the story for me. The premise itself is intriguing – a serial killer is on the loose, targeting pairs of best friends. Who knew that friendship could be so deadly! Shortly before their deaths, each victim is given a small white book with a c I love books that feature unusual protagonists, so this one fitted right into that category. Kim Tribbeck is a stand-up comedian who, like most comedians, has a dark side, and some unusual quirks. I loved seeing the world through her POV, and she really drove the story for me. The premise itself is intriguing – a serial killer is on the loose, targeting pairs of best friends. Who knew that friendship could be so deadly! Shortly before their deaths, each victim is given a small white book with a cryptic message that has police totally baffled. Watching the news, Kim remembers an incident a few months ago when an audience member of one of her shows had handed her a similar little book. Mystified, Kim had thrown it in the bin without understanding its implications. But how does Kim fit into this, when she doesn’t even have a best friend? In fact, Kim is a loner, having recently split from her husband, and she is estranged from her family. So what would Billy-Dead-Mates (which is what police have dubbed the killer – don’t you love it?) want with her? Could her life be in danger? I really enjoyed Sophie Hannah’s latest book, especially the chapters narrated by Kim, who was such a quirky, fun character to get to know. Being a comedian, she comes out with the most hilarious cynical quips, and her observations are spot-on. Hannah tries to liven the book up by using different formats to tell her tale: there are excerpts from a manuscript Kim Tribbeck is writing about her life, emails, letters, “inspirational stories”, a newspaper column all interspersed with the more traditional first and third person narratives. There are also quite a number of different characters to keep track of! I initially found some of these threads a bit confusing, but was happy with the way it all came together in the end. I liken my reading experience to putting together a 1000-piece jigsaw puzzle – initially all you see is a jumble of shapes, but when it all comes together there is a big collective sigh of “Ahhhh! Yes, I see it now!” – which was quite good fun! If anything, some parts of the investigation dragged slightly and could have done with some careful editing, but I was so intrigued that it never lost my interest. I didn’t realise that this book was part of the Spilling CID series, which I had not read before. Seeing how I really liked DC Simon Waterhouse and his wife Charlie, I may have to pick up earlier books in the series as well! All in all, The Next To Die was a slightly unusual but fun reading experience for me. I loved Kim’s character and would love to see her back in another book, realising that this is unlikely. If you are a reader who enjoys different narration styles and don’t mind getting taken along several plot-lines during the course of the story, then you will enjoy this one. The clever mystery at the core of it all was definitely worth the journey! Thank you to Edelweiss and William Morrow for the free electronic copy of this novel and for giving me the opportunity to provide an honest review. The book reaffirms why the wonderful Ms Hannah is one of my favourite authors. Devilishly clever plot, keeping you guessing all the way. The return of the wonderful Simon and Charlie was enough to make it a must read. Involving a comedienne in the story gave the opportunity for a lot of very funny lines, and a couple of witty parts within the first couple of pages gave me no doubt (not that I really had any) that this was going to be a fun ride. As the owner of a small bookshop, the lines "Books The book reaffirms why the wonderful Ms Hannah is one of my favourite authors. Devilishly clever plot, keeping you guessing all the way. The return of the wonderful Simon and Charlie was enough to make it a must read. Involving a comedienne in the story gave the opportunity for a lot of very funny lines, and a couple of witty parts within the first couple of pages gave me no doubt (not that I really had any) that this was going to be a fun ride. As the owner of a small bookshop, the lines "Books don't commit murders. Even the very worst of them. That's why books are so much better than people" resonated totally! Saw that another review called this a "Whydunnit", and the "Why" the murders were committed was refreshingly different and gave the book an extra enjoyable edge to this reader. Beware of strangers bearing books!! Sophie Hannah rarely disappoints and this novel is no exception. The beginning gives no hint of where it is going, being an email from an agent to a publisher regarding a book written by Kim Tribbeck, a famous stand-up comedian. We are then taken inside Kim’s book, Origami, which tells the true story of a series of murders in which Kim becomes embroiled. Kim is a loner, she readily admits that she doesn’t have and indeed doesn’t need friends, although she has bee Beware of strangers bearing books!! Kim is a loner, she readily admits that she doesn’t have and indeed doesn’t need friends, although she has been married to the dope addict, Gabe and has also had an affair with the intensely irritating Liam, a man with no personality at all. She herself is not any easy person, not getting on with her half-brother Drew or with her dying Grandmother, Marion. The catalyst to Kim’s involvement with the police comes when she sees a news report which tells of how the victims have each been given a small white book with a single line of poetry inside shortly before they were killed. She realises that in fact she has also received one of these books and so she goes to the police to see if it is relevant. The story then moves between Kim’s book, the conversations and actions of the police, and the ravings of Sondra Halliday, a writer who is convinced that the murders are the work of a misogynist, because three of the four victims are women and that’s what men do! The book is chock full of eccentric characters, from the explosive DI Proust (the Snowman), the brainy DC Simon Waterhouse who appears to have Aspergers, Sergeant Charlie Zailer, Simon’s harassed partner, to DC Colin Sellers, who believes he is God’s gift to women! All are fleshed out and real although one could feel that if the police really had to rely on this lot they would be in trouble; but this is fiction and we like our police to be as colourful as possible. The murderer has been given the soubriquet of Billy-dead-mates, as he appears to be killing pairs of best friends, but as to motive the police have no clue. I really enjoyed this romp through murder and eccentricity mixed with flashes of humour. Whilst you will probably guess the identity of the murderer before the end, I very much doubt that you will guess the motive! Definitely worth five enthusiastic stars!! Sadly, nowhere near as good as the previous books in the series. Not enough Simon, far too much Gibbs and Sellers, ridiculous antics from Gibbs and Liv, terrible portrayal of feminism, and a rambly nonsensical plot with a ludicrous motive. Sophie Hannah can do much better than this. Over the course of nine books and books and nine fiendishly complicated cases investigated by the Spilling police force I have had some ups and downs. I have read some fabulous stories, with the kind of wonderfully twisty plot that no-one else I can think of could produce; and even when I have found failings they have been balanced by good things that have stopped the lows being too low. I could tell you where each of those first nine books comes on that scale but not this one. It’s a strange one. Over the course of nine books and books and nine fiendishly complicated cases investigated by the Spilling police force I have had some ups and downs. I have read some fabulous stories, with the kind of wonderfully twisty plot that no-one else I can think of could produce; and even when I have found failings they have been balanced by good things that have stopped the lows being too low. It follows has many of the same features as the books that came before, but thing are a little different this time around. The scenario is a little less inventive than usual; it could have come from one of those contemporary crime novels that I like the look of but don’t really feel the need to read.. The story opens with the Spilling detectives working with two other police forces, trying to catch a killer they are calling ‘Billy Dead Mates’. He has killed two pairs of best friends; not together, one at a time. Each of them has been killed in their own home, shot dead with no sign of a struggle or of forced entry. There is nothing to link the two pairs of friends. Except that each of them had been given a small white book in which a single line of poetry has been written. That was the touch that told me that this was Sophie Hannah. The story needed something to elevate it, and it had something. It had the draft manuscript of a book by Kim Tribbeck, a stand-up comedian who had been caught up in the case. She had been given one of the small white books, but she hadn’t died, and she didn’t have a best friend. She had an ex husband, she had an ex lover, but she wasn’t close to anyone at all. Her narrative voice was wonderful, and though she wasn’t likeable she was a fascinating character. I was sorry that she spent so much time entangled in a sub plot with one of the Spilling detectives. They’re interesting at work, but when the story looks into their personal lives it just don’t work. Enough! There was a radical feminist writer caught up in the case too. She was convinced that the killings were femicide, ignoring the fact that one of the four friends was male, and she was receiving letters arguing with her position on just about everything from somebody who might or might not of been the killer. There were stories too; some of them from a rare book that had been given to Kim by her former lover. None of the elements were great on their own, but they came together to make a fabulous, page-turning story. I had an idea of who the killer was, but I didn’t know how or why. When the answer came, I realised that the clues had been there. That’s not what I expect from Sophie Hannah. I’m used to her tying a plot into complex knots that appear impossible to undo, then throwing the whole thing up into the air with a flourish and having it land as a clear picture, that I never would have foreseen but I had to acknowledge made sense. The answer was both inspired and ludicrous. The logic worked but it was so improbable. I had to love it. But I can understand why others don’t. I accept that the world of this book isn’t quite like the real world, and it isn’t quite like the world you find in other crime novels either. It allows Sophie Hannah to create intriguing puzzles, to say things about the state of the world, and to do things that no other crime writer can. This review has been hidden because it contains spoilers. To view it, click here. One of the most ridiculous books I've read. I came to it after having read "A Game For All The Family" which I enjoyed for its twists and turns. I sometimes alternate between reading a thriller and then reading something more literary. But I so enjoyed the suspense and mystery of A Game For All The Family that I was keen to read Hannah's latest novel. There are so many police characters that I struggled remembering (or caring) who was who. There was a ridiculous subplot that was so pointless and One of the most ridiculous books I've read. There are so many police characters that I struggled remembering (or caring) who was who. There was a ridiculous subplot that was so pointless and stupid. This review has been hidden because it contains spoilers. To view it, click here. It took me ages to get into this book. I started to like it about half way through. Then I find out the killer is on a murdering spree because she doesn't like e-readers! what a load of rubbish. Sorry to be so rude to the author but I truly wish I hadn't wasted a week of my life reading it. On a positive note I have read some of her books before and they were pretty good, this one wasn't. Ive read a few Sophie Hannah books some have been ok but safe to say this book was the one that made me vow to never read this drivel again. I'm trying to thing of some good points here but I am struggling! I actually do not know how an author can make a murder mystery plot so dull. characters were irritating and dull. This did not pass the commute well for me. Today on Ridiculous Motives to Kill Five People. I've always loved this series, but was so disappointed by this one. After a promising start, it got progressively more implausible and ended with the murderer apparently having a motive better suited to Scooby Doo. Do yourself a favour and stick to the earlier books. Kim Tribbeck is a comedian who some time ago received a mysterious white book with a line of poetry inside it. She is shocked when she later learns that other people who have received similar books are now all dead - and that they appeared to be best friends! But Kim doesn't have a best friend. Plus, she received her book ages ago, and is still alive! So what is going on? The set-up is good. Somewhere inside this 400 page book is a decent 200 page mystery. But we get a stupid, pointless subplot i Kim Tribbeck is a comedian who some time ago received a mysterious white book with a line of poetry inside it. She is shocked when she later learns that other people who have received similar books are now all dead - and that they appeared to be best friends! But Kim doesn't have a best friend. Plus, she received her book ages ago, and is still alive! So what is going on? The set-up is good. Somewhere inside this 400 page book is a decent 200 page mystery. But we get a stupid, pointless subplot involving Charlie Zailer stalking her sister to find out what secret she is hiding from her. It has nothing to do with the main story. I skipped all the chapters involving this stupid subplot. It can removed entirely from the narrative and not effect ANYTHING. Why on Earth didn't an editor excise all of that rubbish? Rest of review contains spoilers! (view spoiler)[Other elements super annoyed me. Maybe writing Hercules Poirot mysteries has rubbed off on Hannah's other works, because the hokey, quaint get-together of the central characters as the killer calmly revealed their motivations felt like something out of Agatha Christie's era. It didn't feel as if there was any urgency to it whatsoever! No feeling that Kim was ever really in danger, despite constantly telling us she was. I hated the author's manner of having the detective, Waterhouse, know what was going on but remaining stubbornly obtuse about it for no other reason than he seemingly can! A character even points out that this only happens in fiction, but it hardly subverts the trope! THE KILLER DID IT BECAUSE THEY HATE E-READERS (Kindle, Kobo etc). You read that right. THEY DID IT BECAUSE THEY HATE KINDLES. I just stared at the pages in front of me in disbelief. Was this some sort of joke? Passive aggressiveness from an author at a technological innovation that she thinks may destroy traditional publishing? (And although e-readers are popular, the publishing industry isn't in any true danger of extinction as yet, from what I've read). It's certainly not the sort of believable motivation I would expect from what had otherwise been a decent mystery that was keeping me guessing. I was expecting something a bit more, well, innovative than that! Seriously, SHE KILLED SIX PEOPLE BECAUSE SHE HATES KINDLES. There was a lot I enjoyed about this novel. Indeed, I probably enjoyed the first two-thirds. A lot. The plot unfolds in first person via Kim – at the time of the investigation; also via other characters (in third person); and also via a book Kim’s writing about the events (some time in the future). It sounds a tad complicated but in reality it’s pretty easy to follow what’s happening. My biggest gripe with this book is actually about the crimes and their motivation. Hannah keeps us guessing for mo There was a lot I enjoyed about this novel. Indeed, I probably enjoyed the first two-thirds. A lot. My biggest gripe with this book is actually about the crimes and their motivation. Hannah keeps us guessing for most of the novel and does a great job of that. Pairs of friends have been killed and there’s undoubtedly some dastardly reason. However selecting Kim and her mostly-estranged grandmother really doesn’t fit that pattern. And Kim (and Simon to an extent) both tell us they sympathise with the perpetrator and understand why they did what they did. Which made no sense at all. As I said, I enjoyed the first part of the book – which is as much about Kim and her life – as the crimes and police investigation. Hannah does a great job with Kim – a comedian who puts on a prickly and ballsy front she believes people expect, but is actually a sensitive likeable character. To be honest three stars is being generous. The three stars is because I liked most of what I was read until the most ridiculous motive for murder ever written about was disclosed. I'm not sure if this plot was some kind of private joke that got out of hand, but really? I decided to read this one based on an interview the author had on BBC. The premise sounded intriguing enough, but the murder motive turned out to be absolutely bonkers! Not to mention the tedious investigators and the unnecessary subplots that went on and on. Probably only 7 out of 10. Too much feminism and very far fetched. Not as good as her others. Third novel by Hannah, second overall this month, but I'm not complaining. This novel was more of a mystery rather than a thriller, but it was still very enjoyable to read as are all of her novels. Hannah never fails to disappoint even though some parts aren't the best, the best parts of the novel always manage to boost the rating of the book. I loved the complexity of the plot in this novel and it was very intriguing to find out what will happen next. Who will be the next victim and why is the murderer killing in pairs? Most important of all, who is the killer and are all the victims connected? Kim and Charlie were my favorite characters in the novel and if I'm being honest I would love to see them together in future novels of Hannah as a duo. I loved the fact that although the nvoel was centered on the murders of "Billy Dead Mates (or Women)". We also got to learn more about Charlie's family and we even got to see a little Kim and Charlie sleuthing. The killer was very well revealed but in the end it got a little dragged on and it could've been done in a faster manner. Overall, a great mystery novel and a for sure to be success on bookshelves! I've got to the stage with Sophie Hannah novels where I become desperate to read them, but once I am reading them I don't want them to end. And yet I do, because I need to know what on earth is happening! It's very hard to write about this novel without giving the plot away, which would be a horrible thing to do. So I'll just say that it's up to her usual standard - an insane, impossible mystery, the familiar cast of characters - Simon, Charlie, Gibbs, Sellers, Proust the Snowman, etc - as well I've got to the stage with Sophie Hannah novels where I become desperate to read them, but once I am reading them I don't want them to end. And yet I do, because I need to know what on earth is happening! It's very hard to write about this novel without giving the plot away, which would be a horrible thing to do. So I'll just say that it's up to her usual standard - an insane, impossible mystery, the familiar cast of characters - Simon, Charlie, Gibbs, Sellers, Proust the Snowman, etc - as well as some new ones, and lots of wit, humour and sarcasm. The humour is particularly strong in this one as one of the characters is a stand-up comedian. For the first time ever, I guessed who did it and why (though not until towards the end), so I felt rather pleased with myself, as I usually have no idea until Simon explains everything. But that's not a detraction from this story in any way. If you're a fan of this series, you will love it - and we get to find out more about the Liv and Gibbs mystery too!